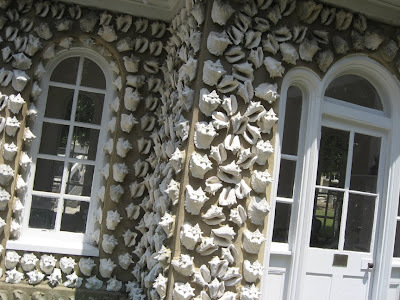 (Above) This house, made of concrete and embedded conch shells, was built in the late 19th century. Click for larger view. (Above) Entrance to the Shell House. Click for larger view. (Above) Another view of the entrance area. Click for larger view. (Above) Detail of the embedded conch shells. Click for larger view. (Above) Beautifully painted African-American barber sign. Click for larger view. (Above) Naturally, I turned around when I saw this sign on the way to the airport. Click for larger view. (Above) This sign was adjacent to the other on the same lot. Click for larger view. (Above) This giant and majestic Live Oak is believed to be over 600 years old. Click for larger view. (Above) Another view of the tree. Click for larger view. A FEW WEEKS AGO MY WIFE AND I WENT TO CHARLESTON, S.C. TO VISIT OUR DAUGHTER, who is attending M.U.S.C. (The Medical University of South Carolina). It was wonderful to be back in the deep South, where the Live Oak trees drip Spanish Moss and the taste of sweet tea still resonates with my taste buds. As it was on many Foster family vacations, my travel weary kids heard too many times the explanation: “daddy has to take a little side trip, kids” as we visited places like W.C. Rice’s Cross Garden or other art environments. On this trip, though, with children now grown, I was left alone for a few hours to explore. Alone. OMG! This is what I live for. To drive aimlessly into places unknown, guided only by instinct and a sense for the odd, obscure and eccentric. Posted for you, my dear readers, are some images from that day, my “daily catch” like the seafood signs one sees throughout Charleston. First up, I spotted this small house covered in sea shells. Of course, I was intrigued. Walking inside the open gates, I found that the small house was on the grounds of an exclusive private girls school called Ashley Hall, which was founded exactly one century ago in 1909. I spoke to one of the administrators who kindly allowed me to photograph the shell house and gave me this information: “The shell house was originally part of the estate of a Mr. Charles Witte, and was used as an aviary at his private residence around 1880.” Apparently, “shell houses” like the one I am showing you here were quite popular in Victorian England, according to their spokesperson. The shell house here was originally used as a chemistry lab in 1909, morphed into a smoking lounge in the 1970s, and is today used as a lounge for the seniors. Next up was a beautiful barber sign painted on the side of a building in an African American neighborhood. I liked the simple, illustrative way the sign was painted, with the barber standing ready to give a small boy a haircut. 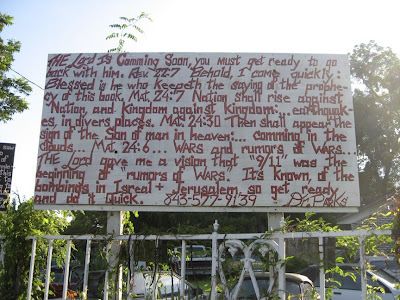 After that, were two great apocalyptic religious signs painted on full sheets of 4’ x 8’ plywood, with references to 9-11 and the “end-of-days” scenarios. These were excellent examples of our freedoms of speech and religion at work. Finally, the mighty and ancient Live Oak was found on the famous Boone Hall Plantation, founded in 1743. That tree alone, a survivor of hurricanes and witness to so much history, was a highlight of not only that day, but the trip as well. Hey Crazy Drile! thanks! I appreciate that you dropped in... come back, the door is always open! I love a good road trip and all the associated side trips. Do it all the time! Great post, loved the shell house and I know a few people here in NYC who think 9/11 was the beginning of the "end" as well. That tree puts it all in perspective, that we humans do not rule the world as much as we like to think. As an aside, I'm following a number of blogs from the South and can't help think that I need to move back there someday. Am I too Liberal? No Maureen, you are not too liberal. The South is more progressive than you think. You might not want to move to Texas, though. Definitely not interested in moving to Texas, but I'm intrigued by Charleston at the moment. Even Virginia went Democratic across the board this past election. Who knows how long that'll last, though. Shell House has been a haven for Ashley Hall seniors at least since the 1950s. I was there in the mid-1960s and spent many an hour there. Fernando Viciente: Beauty is only skin deep.